A fantastic dental website doesn’t have to be overly complex. On the contrary, it should be easy to navigate and be the embodiment of simplistic design. We create beautiful bespoke websites for dentists that reflect the unique essence of your practice by capturing the attention and imagination of your new and existing patients. A good dental website design builds trust in your website and in your business. Bad design sends visitors away in search of something more reliable. Dental SEM has a wealth of experience in both UX Design (User Experience) & UI Development (User Interface). A focus on human behaviours and psychology to understand why people do what they do. It combine research with design skills to produce effective solutions/concepts that businesses can use to help users. A focus on the way the functionality is displayed and the detail of how users interact with the interface (or website). Technical design are used to make sites look great as well as function well in a browser. What use is a nice looking website if it doesn’t function well? It can frustrate the users. UX/UI design affects every aspect of your website, from navigation to individual page layouts; a website that is designed with UX & UI in mind drives more traffic to your site, and create conversions. From the start, we create compliant websites to conform to GDC and ICO regulations. We also comply to Internet standard by creating a clean website that is coded to W3C guidelines. The use of smartphones to access the web is sky-rocketing, with 69% of traffic coming from smartphones to search the web. 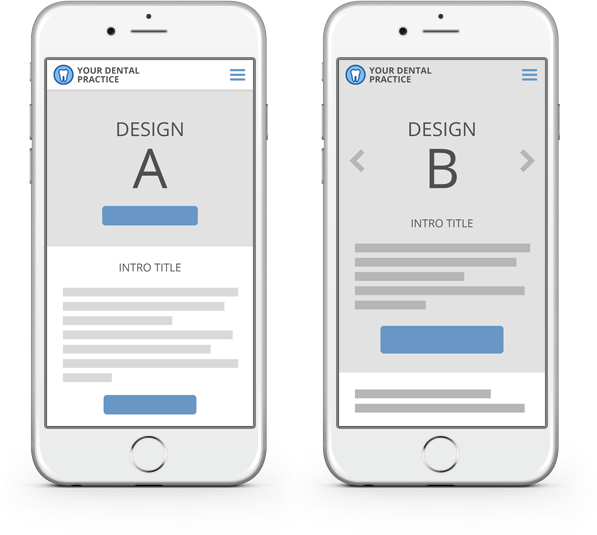 By creating a responsive website, we ensure your patients can find you no matter what device they are using. With the look and feel of your main website, your mobile website is coded specifically for optimum performance on Google (which has a different algorithm for mobile devices) and for optimum appearance on other smaller screens, such as tablet devices. We test various pages of your website to give us an insight into visitor behaviour. The premise of testing is that you have two designs of a dental website: A and B. Typically, A is the existing design (called the control), and B is the new design. We split your website traffic between these two versions and measure their performance using metrics that you care about (conversion rate, sales, bounce rate, etc.). In the end, we select the version that performs best. The infrastructure that supports your website is very important, as any money invested within marketing will be money wasted if your website is not secure, live, and up-to-date. Our system works 24/7 to monitor security, and provide 99.9% reliability. Copywriting is the art and science of creating content that prompts the reader to take action. Great copywriting turns visitors into patients. The emphasis when writing content is on including keywords and links to assist in search engine optimisation (SEO), which in return will make your website rank higher in search engines like Google. If your goal is to make your website more visible, and attract more visitors, it’s no good if the content doesn’t motivate your visitors to make an appointment. We make sure each page uses patient friendly, non-clinical terminology, and the right tone of voice for you and your practice. We can provide all of your keyword related dental copywriting, from webpage copy to email marketing copy.